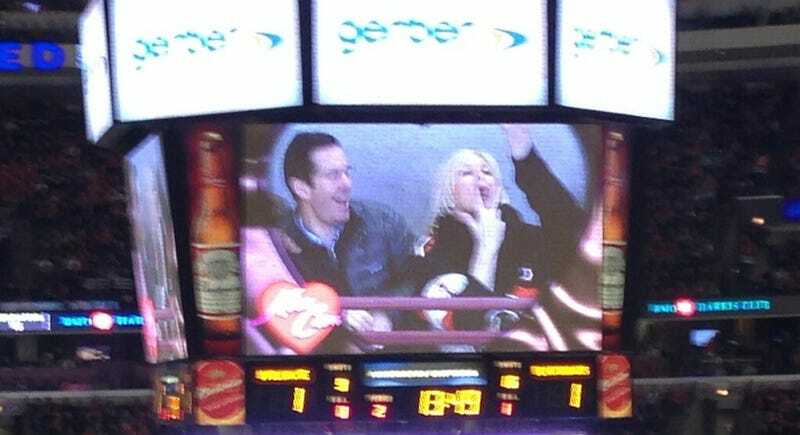 Here's a lady and gent thoroughly enjoying their time on the United Center's Kiss Cam during the Blackhawks win over the Colorado Avalanche. And why not? The Blackhawks won again tonight with a last-minute goal from Daniel Carcillo; it was his first of the season. Jonathan Toews also chipped in with a shorthanded goal to tie the game earlier in the period. Chicago is now 21-0-3 this season and winners of 11 straight. The win also pushes that consecutive points streak to 24 games for the season and 30 overall. Chicago hasn't lost a game in regulation in nearly a full calendar year. Lockout notwithstanding, it's impressive. Moving south, Chicago's streaking buddies, the Miami Heat, also extended their winning streak to 16 games with a similarly late game-winning shot. LeBron had 26 points, the final two coming with 3.2 seconds left to give the Heat a 97-96 lead. Arron Afflalo's desperation shot fell short and Miami keeps rolling. Both Chicago and Miami are in action again Friday. We're not sure about the other two.